It’s a moment every parent dreads. You’ve picked up your little ones from school and the first thing you notice is their incessant head scratching. Nope, not chicken pox – head lice! What do you do?! It’s a tough situation, but it’s important not to panic. You’re not alone! Head lice are very common – 50% of Australians are affected at some point over their lifetime¹ so don’t be hard on yourself. Head lice are a very normal part of childhood, and can spread very easily from child to child at school. In fact, if one child has lice, others around them are highly likely to be the next head the lice hop to. First of all, make sure your child’s scratching is in fact head lice. Grab a fine tooth comb and have a good look. You’ll spot them pretty quickly if they’re there. The lice are very small, and spend a lot of time close to the scalp. Make small parts in your child’s hair to have the best chance of spotting them – it can sometimes be tricky on darker hair or skin. Assuming it is head lice, the next step is treatment. The faster you act, the less time the lice have to breed. Treatments can involve applying a product to the hair and scalp to kill existing lice and eggs, manually wet combing the lice and their eggs from the child’s hair, or seeing a specialised hairdresser who can treat and remove the lice for you. Luckily, MOOV knows parents are busy, and so they have developed a range of 6 at-home products to help you and your family remove lice. The product range is categorised into their 3 functions – Kill, Remove and Defend. MOOV Head Lice Solution is the number one selling head lice product in pharmacy² and can be used to help kill head lice and eggs. Treatment is also available for younger or more sensitive scalps in the form of MOOV Head Lice Sensitive. MOOV treatment products are administered on day 0, day 7 and day 14 to help ensure that the head lice life cycle is completely broken. MOOV also provide a comb to help detect head lice and a conditioner that can be used to help manually remove head lice. The next item in your lice-repelling weapon kit is the MOOV Head Lice Defence Spray.It’s the number 1 defence spray available in pharmacy³, and provides 8 hour protection against head lice. The best thing to do when you child comes home scratching with a confirmed case of head lice is to use MOOV Head Lice Solution to kill head lice and eggs. After each treatment use the MOOV Head Lice Removal Comb to help remove head lice and eggs. To keep newbie lice at bay, begin each day by spritzing the hair with MOOV Head Lice Defence Spray. 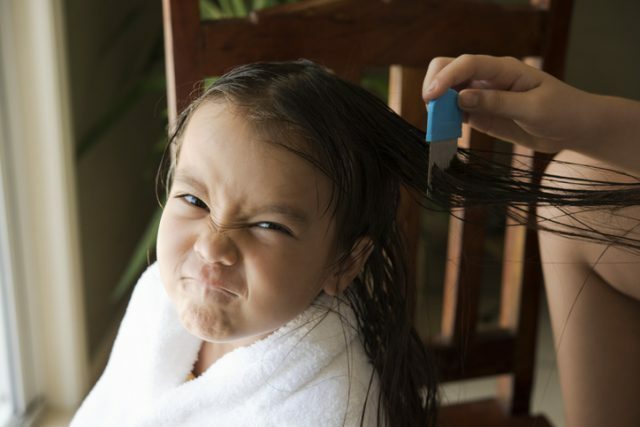 Committing to regularly checking your child’s hair for lice can help prevent further outbreaks. 1 A Study Head Lice Treatment, TNS Consultants, Sponsored by Ego Pharmaceuticals Pty Ltd., June 2011. 2 IRI MarketingEdge, National Pharmacy, Head Lice, Dollar Sales MAT 02/09/18. 3 IRI MarketingEdge, National Pharmacy, Head Lice, MOOV Head Lice Defence Spray Dollar Sales MAT 02/12/18.